I just made these potatoes for the first time in years. It's probably been ten years since I made them, and I have no idea why. Where have these potatoes been this last decade? Actually, they've been buried in my recipe binder. The one that I disassembled when I started making recipe cards. Because I'm compulsive, I decided I was going to methodically go through all my recipes and decide, one at a time, which recipes were worthy of their own digitally scrapbooked recipe card. Towards that goal, I give you this recipe. These potatoes are gooooooood. And easy. I originally got the recipe from Velveeta, and it was actually titled Bakersfield Party Potatoes. Well, I've been to Bakersfield, California, and I'd prefer not to think about it when I'm eating these delicious potatoes, so I abbreviated the name for the sake of the recipe card. It's nothing personal, Bakersfield. It's just that I have an unpleasant Bakersfield memory. Picture this, it was July of 2005 and the girls and I were traveling through Bakersfield on our way home to Idaho. July is not the most pleasant time of year in Bakersfield. Although I wouldn't quite call it the armpit of America, it gets pretty close when the temperatures climb. On our drive through, we had to stop for an emergency potty break, and when we got back in the van, 18,000 flies joined us. We spent the next 10 hours of driving rolling the windows up and down, trying to rid ourselves of the nasty hitchhikers. All the while my hysterical oldest child was freaking out about the flies and screaming every time one landed near her. That is, frequently. Eew. I seriously do not want you to be thinking about flies when you look at this recipe, so I don't know why I even went there. Just erase it from your psyche. So, the recipe. You might think this recipe looks a lot like the recipe for Funeral Potatoes, but this recipe is a little different. First of all, it doesn't use sour cream and it uses only 1 can of the Cream of Chicken soup. Although there are quite a few versions of Funeral Potatoes. 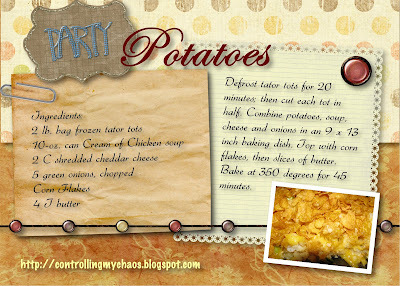 I suppose that, to someone, this recipe could actually be Funeral Potatoes. That's neither here nor there though. These potatoes are just the right amount of crunchy and chewy. And I'm pretty sure they aren't Weight Watchers approved. You'll love 'em though. I promise. Make them today. Oh, and you're going to need some butter. Oh and I forgot to mention last post that your tooth fairy episode cracked me up. I forgot last week and you'd think because I actually sell a stinkin' tooth fairy pillow, I would have done a bit better. Anyhow, I just let her know that it was a VERY windy night and the tooth fairy had a very hard time making his way in through the window and she was so very sorry, but tonight will be just right. mmmmm, carbs. Sounds great, maybe I'll try them for thanksgiving. We love these potatoes. I make them for company and especially at Easter when we have ham! :) On Sundays when we would have a visiting pastor or missionary over, I would make these and ALWAYS ALWAYS got compliments on them! YUMMY!